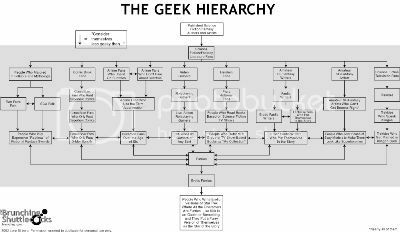 I don’t find much to fault in this chart by The Brunching Shuttlecocks describing the social hierarchy of different types of geeks. My only nit is that “comic book fans who only read X-Men spinoffs” are considered on the same level as “Trekkies who get married in Klingon garb.” Uh, no. A comic book fan would have to work pretty hard to earn that much pity. What say you? See any discrepancies? And, no, your vote doesn’t count if you’re a Furry. Or a Klingon-garbed Trekkie. What this chart forgets is overlapping areas, You can be the top tier and the bottom tier at the same time. Therefore they should’ve used a ven diagram in addition or some mention that should you overlap any of these areas you are equal to the awesomeness of Furry kind. They’re all geeks to me.